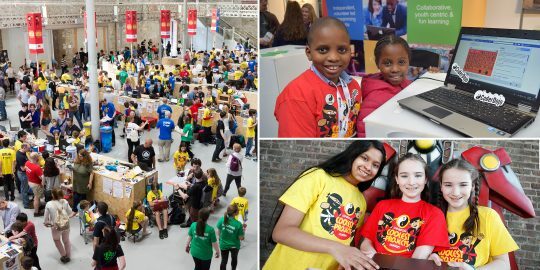 Showcase your projects at Coolest Projects in California, this September #CoolestProjects @coolestprojects « Adafruit Industries – Makers, hackers, artists, designers and engineers! On September 23rd, Coolest Projects will be hosting an event at the Discovery Cube Orange County in Santa Ana, California where young people who make with technology will be showcasing their work to people of all ages. If you want to submit a project, sign up here. And if you just want to attend, get tickets here. Coolest Projects is a world-leading showcase that empowers and inspires the next generation of digital creators, innovators, changemakers, and entrepreneurs. Coolest Projects takes place in the United Kingdom, Ireland, and North America. There are also regional events all around the world, led by amazing community partners and friends of the Raspberry Pi Foundation. Coolest Projects is for young innovators who make stuff with technology. If you’re between 7 and 17 and making something cool with technology for fun, to solve a problem, or as a creative outlet, then we want you to come out and share your projects with us! Adafruit is sending along some hardware in support of the event as we love to see more kids getting involved in making. The more people who register, the better. So if you have a project you want to show off or there’s something you’ve been meaning to build and want to join up, register here!